In July this past year I was fortunate to participate in an NEH Summer Institute on Implementing Digital Humanities in Community Colleges. Though I had been involved in DH via my research for many years, I had yet to experiment with my teaching for a number of reasons. Mainly, I wasn’t sure how I would transfer what I had been learning about digital pedagogy in a community college environment. How could I evaluate digital work alongside the stacks of writing I had to grade? (25 students x number of assignments x number of sections I’m teaching = not a lot of time or energy for much) Armed with new information and some great ideas, I began my experimenting this year with my first year hybrid composition sections. 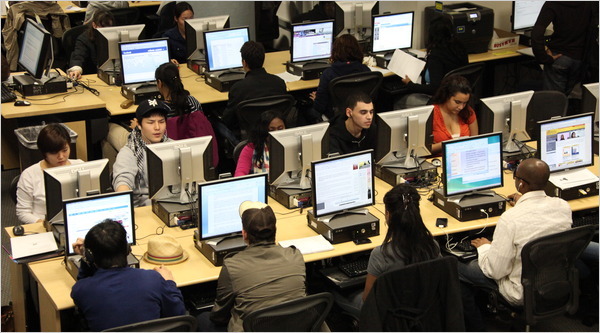 I’ve already written about the immense value I saw early on of having a computer lab for our face-to-face classes. Far from a distraction, computers have become a necessity not only to complete our digital projects, but also to develop their writing. This is perhaps not a revelation. Any composition teacher who has taught writing classes with a “lab” component knows the benefit of getting to watch students write in front of you so they can ask you questions as they’re navigating your instructions. But given the tense discourse within higher ed communities about having (let alone “using”) technology in the classroom, I want to go out on a limb and stress that not only is having technology in the classroom not detrimental to my teaching, it is also an invaluable asset to enabling digital humanities pedagogy for an otherwise difficult-to-reach population. My own experiments have reinforced some of what I already knew (like the myth of the digital native), but also opened my eyes to the unique challenges my students have in grappling with new technology and maneuvering through the digital sphere. My own sister is attending one of the best public high schools in the nation and has the additional benefit of a highly educated, professionally successful support network. She can work with word processing software, file sharing, and html manipulation with ease. Some (a minority) of my students are similarly adept, and some (an even smaller minority) are better than me at almost everything digital. Most, however, barely know how to change a file format when they save a document. Their eyes always widen when I explain that the process we are learning is fairly standard in most white-collar business environments and that, prepared or not, employers will expect their generation to be able to handle these types of digital technologies and methods with relative ease. Let me state that most of my students come from countries and communities where they are glad to have enough textbooks and reliable internet let alone “Makerspaces” and tablets in the classroom. Many do not own personal computers at home, and, even if they do, they are sharing them with other family members, trying to squeeze homework in between two or more jobs, and largely working with barely functioning software and hardware. Their formal instruction in using these devices has been haphazard at best (at worst frustrating and embarrassing); their instruction in using them creatively, productively, and critically is non-existent. Having computers in our classroom not only provides the tools they need to complete, or at least make significant progress, on their digital work, it also enables them to have a safe space where they can work out their frustrations with similarly frustrated peers, where they can ask all the questions they need to, and where they have time (and space) to engage fully and critically with our work. I’m confident that a significant percentage of my students would have dropped this class by now if they were not able to use computers during our face-to-face meetings. Much of our class time involves doing/making/writing instead of lecture because I want them to have that time (and space) to try, fail, experiment, innovate, and, ultimately, learn. Post Instructions in Multiple Places – as much as we like bemoan a generation that has too much difficulty “figuring out” things on its own, I am a firm believer in detailed instructions for my digital assignments. In addition to going over them in class, I also write step-by-step instructions that I post on our course management system, inside the file share program we use, and a hard copy which I give them in class. Not all of my students are auditory learners. Even if they do not have accommodation to get written as well as verbal instructions, I still do both because I have a wide variety of students including ESL, LD, and visual learners who will do better with written instructions. Simplify At First – recently, I had students perform peer review on projects which they had to upload into Google Drive. I did this partly because they have a google-based school email account already, so access is already built into our system. I am also aware of how common a platform it is for collaborative work within the business world, and many of them still use thumb drives and hard copies instead of cloud-based storage of any kind. Better to learn here with us in this environment, I tell them. But I took for granted the ways in which using Drive for peer review could go awry. It only occurred to me later (after a rather helpful conversation with a colleague) that I should have set up google docs for each of them in the drive into which they could copy/paste their work for review to avoid the incorrect file/multiple versions/access problems that befell many of my students. At least at first, if there is a step you can omit, do it! I’m sure that I’m in for more surprises and lessons as the semester progresses and our projects become more complex. In the meantime, if you want to join the larger conversation about implementing digital humanities in community colleges, follow our hashtag #DHattheCC and like our Facebook page.